As a folk/pop style, vowels tend to be a bit brighter and more forward than in classical music, and pronunciation of consonants tends to be more relaxed and colloquial. (Example: "little" would be pronounced closer to "liddle," and final consonants may be dropped on words like "and.") This is a fairly simple adjustment to make, and is similar to a technique you might adopt to sing a spiritual, folk song or jazz piece. Rhythms, especially in ballads, tend to be very loosely interpreted. Barbershop singing makes extreme use of rubato, most commonly to emphasize really "tasty" chords or to support the emotion of the text being sung. A "conversational" approach to rhythm is often the goal. Barbershop has a unique chord vocabulary. Dominant 7th chords (often called "barbershop 7ths") are prominently featured, and are often used to create strong harmonic progressions based on the circle of 5ths. Minor 7th chords and diminished 7th chords are also common, as are 9th chords (with the 5th omitted), while major 7ths, augmented chords, "add 2," "sus 4" and other chords commonly found in pop and jazz are rare. Most pieces are in major keys, and even minor pieces will often end on a Picardy 3rd so that we get the ringing overtones of major harmony. Traditional Baroque rules of voicing and voice leading don't apply. Every note in the melody is typically harmonized by a four-part consonant chord, almost always in root position or 2nd inversion. Voice crossing is common (especially between the Lead and Baritone voices), as are parallel fourths and 5ths, and leading tones and 7ths often do not resolve in the ways typically expected. Singing barbershop (particularly the baritone part) is some of the best ear-training experience you'll ever have! Speaking of Lead and Baritone, what's the deal with the barbershop voice parts? How do I know which part to sing? TENOR - Sings predominantly in a falsetto or light head tone, harmonizing above the lead. Practical range is a written G above middle C (sounding as the G below middle C) to high G above the staff (sounding as a G above middle C), occasionally extending as high as Bb (or sometimes higher!) above the staff. This part is often sung by choral baritones or even basses with a well-developed falsetto or head voice, although choral Tenor I singers with good facility up high may occasionally sing barbershop tenor. Unchanged or cambiata voices (boys who have not yet completed puberty and who sing male alto parts in choir) should also choose this voice part. LEAD - As the name suggests, this part carries the melody most of the time. Practical range is a low Bb (written below middle C, sounds an octave lower) to a high F# on the fifth line (sounds as an F# above middle C), and occasionally higher. The Lead part is typically sung by choral Tenor I and Tenor II singers, or even Bass I/Baritone singers who are comfortable in their upper register. BARITONE - Similar in range to the Lead, Baritones must have a good ear, as they typically have parts which require a lot of voice crossing with the Leads and challenging intervalic leaps. Choral Tenor II and Bass I (Baritone) singers might choose to sing this voice part. 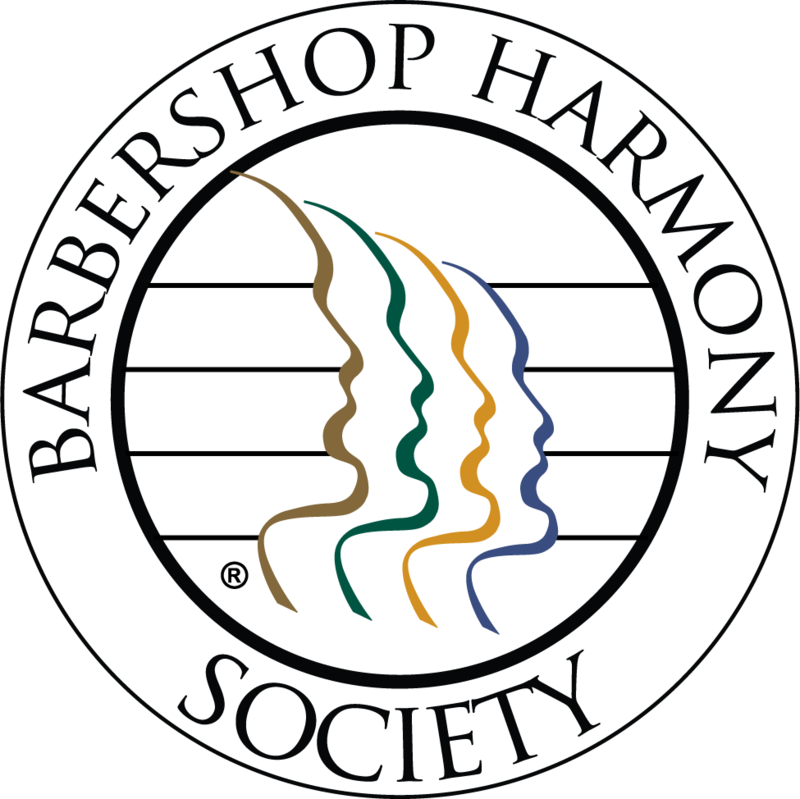 BASS - Similar to its choral counterpart, the barbershop Bass provides the harmonic foundation of the ensemble. A barbershop Bass should have a low G (first line) at minimum, with a solid low F below the staff (or lower) preferred. Your voice gets 'bigger' as you go higher in Soprano range. You like to sing karaoke and be a 'star'. You are assertive enough to sing melody, but you also like the challenge of harmony. You enjoy being adored - basses are the most precious asset in female barbershop, so if you have the range, consider bass for the instant popularity! You are an advanced music reader. You enjoy singing challenging intervals all in a row that don't make sense to other people. You can hold your own part, even when it alternates being above and below the melody. Your sock drawer is organized by color. Your voice gets more light and "flute-like" the higher you sing in a soprano range. You can't tell when you're having a "blonde-moment" because they happen so often.